I'm not a fan of all those cookbooks that encourage parents to sneak veggies into their kids food. How would my girls ever learn to eat, and love, some of my most beloved ingredients if that were the case? I'm also convinced once they know what's in the finished dish, they'd be pretty annoyed and might even swear them off just as a way to show their hurt and betrayal. I say this because about 12 years ago I did a lot of experimenting with ways to substitute eggs in baking. After a friend wolfed down his third brownie, I confessed they were made with tofu. He was as meat and potatoes an eater as they come. Forget the fact that he had already eaten two whole pieces, and likely licked the crumbs from his fingers. He spit out his third brownie. He then disappeared for a few minutes. Perhaps to purge his system of what he just found out I'd fed him. I must admit, I wasn't honest and forthcoming. I knew he wasn't the tofu-type, so I decided to tell him after he'd fallen head over heals for the brownies, convinced he'd see his ill-ways. Well, if that's how the story ends when tricking a man nearing 40, I can only imagine the rebellion a child would conjure up. 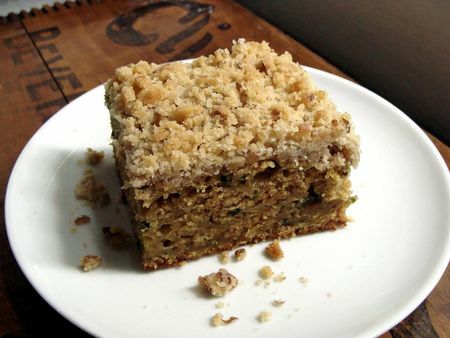 So why in the world am I encouraging you to make a streusel topped coffee cake with zucchini? Well, for one it's not pureed or hidden. Heck I even left the skins on so anyone can plainly see the lovely strands laced throughout. It all started as an inventive way to use up all the summer squash I'd greedily bought. I could've made zucchini nut muffins. But I've been making them for a few years now and wanted something different. Something that would make you raise, or even cautiously furrow, an eyebrow. I started out with the blueprint for a cake. Then the memory of a crumb cake from a bakery long shuttered, where my mom used to buy my birthday cakes, had seeped into my subconscious suddenly. The big sell would be a streusel topping. I mean, who can resist a crumbly, streusel topping? The crumb in my recipe is studded with chopped nuts. The cake has a subtle, refreshing zing from the lemon zest and hint of allspice. Yep, that's sure to bring a smile and look of curious wonder. My girls gobbled every bit and patted their fingertips on the dish, furiously collecting morsels of the topping. They knew exactly what was in this cake—no secrets here, and they even begged for another piece. This post is part of the Summer Fest 2010 blogging event. This week's theme is cucumbers and zucchini. 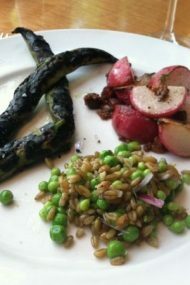 Funny enough I read Shauna's recent post and since this recipe fit the theme, I figured you all might want some other inspiring recipes if your garden runneth over. So now it’s your turn: Have a recipe or tip that fits any of our weekly themes? Starting yesterday, for the next five Wednesdays, you can contribute in various ways, big or small. 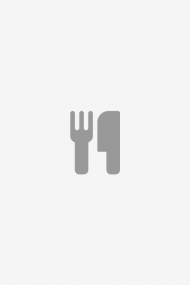 Simply leave your tip or recipe or favorite links in the comments below a Summer Fest post on my blog, and then go visit my collaborators and do the same. The cross-blog event idea works best when you leave your recipe or favorite links (whether to your own blog or someone else’s) at all the host blogs. That way, they are likely to be seen by the widest audience. Everyone benefits, and some pretty great dialog starts simmering. 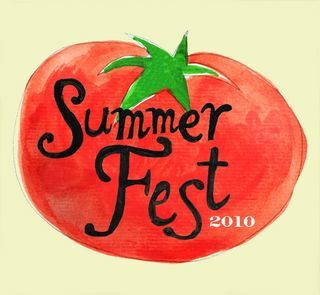 Or think bigger: Publish entire posts of your own, if you wish, and grab the juicy Summer Fest 2010 tomato badge (illustrated by Matt of Mattbites). Cooking Channel TV delves into zucchini’s versatility. The Food2 blog looks at zucchini appetizers. Food Network Dish is loving Paula Deen’s zucchini bread. Food Network’s HealthyEats talks cuke salad and lighter cuke/zuke ideas. Diane and Todd/ of White on Rice Couple are all over stuffed cucumbers with prosciutto and feta. Cate at Sweetnicks is obsessed with cucumber wraps. Paige Smith Orloff at The Sister Project hates zucchini excess (who blames her?). Kelly Senyei of Just a Taste says it’s nonstop cucumber and sesame salad. Gilded Fork is all about zukes and cukes, and Chef Mark Tafoya features cucumber mint soup. Caroline at The Wright Recipes has cucumber salad galore ready, with lemon and poppy seeds. Oh, and marinated summer squash salad, too. In San Diego, Caron is making cucumber and radish confetti soup. Tigress in a Pickle is all about putting things up, or as she says: 50 Ways With Cucurbits. Alana will feature cucumber mint sorbet on Eating From the Ground Up. Judy the Tuscan Diva has fried squash blossoms and more. Tara at Tea and Cookies cooks up stuffed zucchini, zucchini noodles and pickles. Nicole at PinchMySalt delivered a gorgeous grilled zucchini. Shauna embraces cucumbers in a lovely soup. Preheat oven to 350ºF. Coat an 8-inch by 12-inch baking pan with cooking spray or butter. In a medium bowl, mix all the streusel topping ingredients until it forms a wet, sandy crumble; set aside. Whisk the flour, sugar, baking powder, baking soda, salt, allspice and lemon zest together in a large bowl; set aside. In a separate small bowl, lightly beat the eggs and canola oil. Pour over flour mixture and stir with a wooden spoon—it will be very stiff, so don't worry. Add the zucchini and fold until mixed well (it will now look more like a thick batter). Using a rubber spatula, spread into the prepared baking pan. Evenly sprinkle with the reserved streusel topping. Bake 40 to 45 minutes or until a toothpick inserted comes out clean. this looks amazing! especially the crumbly topping, i’m a sucker for those! i tried this no-cook, shaved zucchini salad. really great! definitely recommend it. This looks yummy…and I have a similar tofu infused brownie story (my friends were not too happy!) 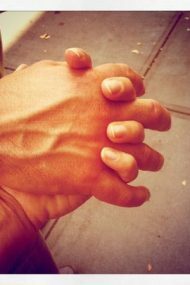 Thank you for sharing, and I am so glad that I found your blog! This is such a great idea! 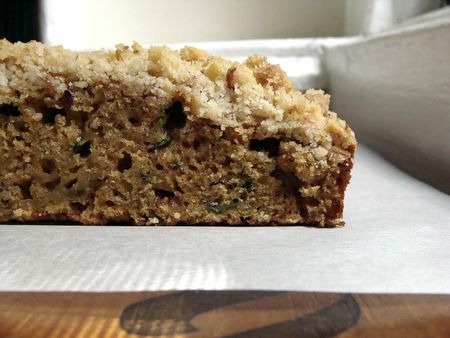 Looks like a great desserty alternative to zucchini bread. This looks like a great cake! I agree with you about not tricking others into eating things they ordinarily wouldn’t by “hiding” them in recipes… I also enjoy incorporating ingredients into my baking, though, to add some extra nutrition/moisture to a recipe… not so much “hiding” as improving and improvising. This looks like a great recipe! I’m getting sick of the same old ones I’ve been making this summer with all of the zucchini from our garden and CSA. Adding this to my list to try! Some are charming, some are seducing, like the candy, chocolate, the cakes, and some burn everything like fire, as soon as you get near. You certainly know how to make magic with zucchini. Air Yeezy,maybe you think that you don’t know much of it.now today give you the good chance to know it more.so only should link my name and know ,perhaos you will order some.